"Mariachi Beat" an album with a new focus. The band has intensively looked at Mexican traditions and asked themselves: What is in fact Mexican? 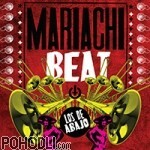 The musical answer is "Mariachi Beat", which is full of traditional Mexican rhythms and melodies. Page generated 21.4.2019 at 01:15:43 in 0.162 seconds.